In 1955 Butlins acquired 4 hotels in the Kent seaside town of Cliftonville from a company called Nicholson Hotels, these being the The St Georges, The Queens (previously known as the Highcliffe), The Norfolk & The Florence. It was originally intended that each hotel would cater to a different taste: one for families, one for young children, one for older folk and one for those without kids. The following year another was added, this time The Grand Hotel (previously known as the Cliftonville Hydro). All were located close to each other and were marketed jointly as The Cliftonville Hotels. Later the seperate classification for each hotel was dropped and they were all operated along similar lines. Guests were allocated a particular one but were free to enjoy the facilities at any of the others. At some point a sixth hotel was added, The Princes, which later became used for staff accomodation. The Queens Hotel had a small indoor swimming pool with underwater viewing windows and it's rumoured that Billy Butlin got the idea from here to install them at all his camps. This pool was later used as a dolphinarium with a pair of dolphins and sealions. The Queens was demolished in the late 1970s. By the 1980s only three hotels remained under the Butlins Cliftonville banner, the Grand, the Norfolk and the St Georges. All three were connected by an underground tunnel and had a total of 254 rooms between them. All three were later marketed jointly as 'The Grand Hotel'. 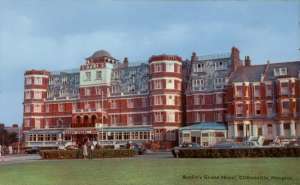 They were sold in 1999 to the Grand Hotel Group but were resold in January 2004 to a local buisnessman who then announced plans to demolish two of them and convert the site into flats. The Norfolk and Grand were demolished in 2005 leaving just the St Georges remaining. The Princes also still stands but has been renamed Walpole Heights and converted into luxury apartments.